Created in 1956, Yard Creek Park is a popular roadside campground and day use area. It covers 60 hectares of beautiful forested upland, as well as a recently expanded area of 115 hectares of riparian habitat along the Eagle River. The park campground was closed in 2003, but is now open and being operated by the Malakwa Community Center Association on behalf of Columbia Shuswap Regional District. It offers 65 quiet, forest shaded RV and tent sites, trails and a popular day-use area with a log picnic shelter. Just 15 kilometers east of Sicamous, along the Trans Canada Highway, Yard Creek is a great spot to use as a base camp for visiting the Sicamous and Shuswap Lake area. 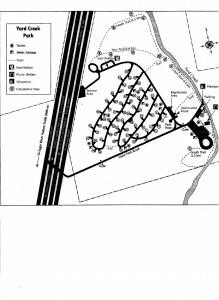 Due to its roadside location, Yard Creek Park is a haven for travelers from May to September. The park usually has vacancies during July and August and most long weekends. The landscape surrounding Yard Creek Park is part of the lnterior Wetbelt characterized by cedar and hemlock forest and lush undergrowth. The park contains a variety of bird species including American dippers. These fascinating little birds dive into the icy waters of the creek and “fly” along under the water in search of water insects. Watch for them on the rocks along the creek. No Reservations are needed. For more information contact our site caretaker @ 250-836-3814. Opening day for campers is May 16, 2018 Our rates are$ 25.00 a night.